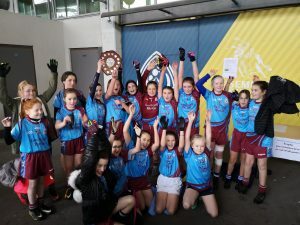 Tar éis míonna a chaitheamh ag traenáil, tráthnóntaí ar pháirc na scoile … cluichí crua imeartha… faoi dheireadh thiar thall, tháinig an lá mór… Stair á dhéanamh ar fhód Staid Semple! The anticipation had been building for weeks. All the extra training, evening sessions, lunchtime sessions, we hoped they would prove the difference. 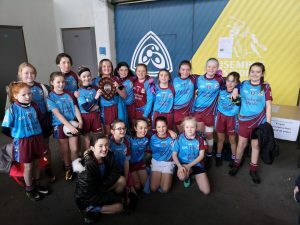 County Final day in Semple Stadium is always a massive occasion for any school involved. This time around, being very special, as history was being made! 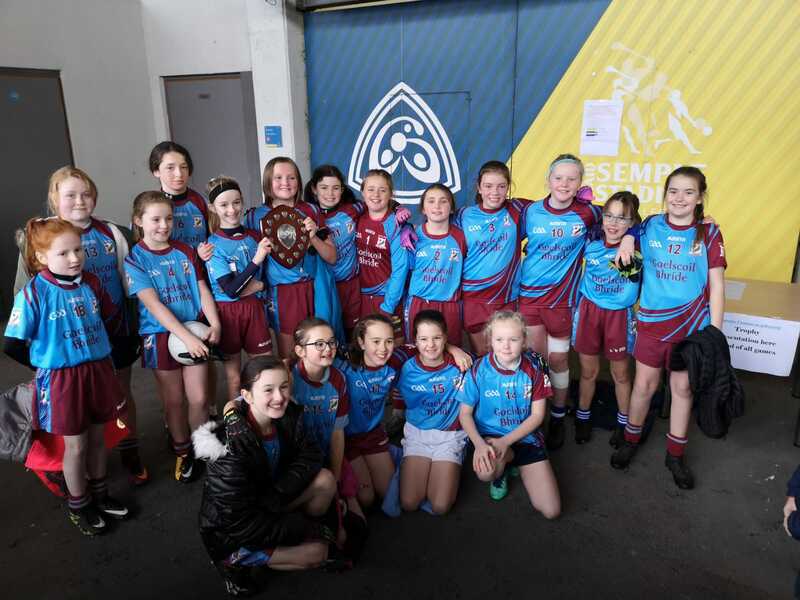 The very first time Cumann na mBunscol football finals would be played on the hallowed turf. The pupils cheered our team as they left the school grounds at 8.45am to begin their preparations for the 9.30am throw-in. Warm up complete, it was time to begin! 40 minutes and St. Joseph’s, Templemore stood between us and a county title. The ball was thrown in and from the off our girls got stuck in. We were the first to score with a well worked goal from the outstanding Maria Ralph. The girls kept the pressure up, winning an early free, which was converted by Maria. Templemore launched an attack from the kick out but our full back line of Niamh Ní Chradóg, Niamh Ni Ghormáin and Molly Nic Uaid Rís, who were tremendous throughout, stood firm. They turned over attack after attack, setting up the platform for another Gaelscoil attack. Working the ball from defence, through the hands of every player on the team, a fantastic goal was scored by Caoimhe Stáicliúm, to extend our lead. Lauren Nic Aogáin and Kaelinn Rossiter worked hard up front, securing a 45 which Maria took, a great kick dipped below the crossbar and ended up in the back of the net! Maria shortly following with another goal to see us head in at half time 4-1 to 0-1 ahead. Both teams took to the pitch for the second half. The girls soaked up the Templemore pressure after conceding 1-1. Ava Ní Dhuibhir worked tirelessly in midfield, along with Aisling Ní Chradóg, blocking and breaking ball. Templemore didn’t give up and fought hard but our defence stood solid. A great move up the field saw Maria bury another ball in the back of the net, before Ava Ní Dhuibhir finished off a fine effort to the bottom corner. We conceded a penalty late on which was saved by our fantastic keeper, Leanna Coppinger. Olivia Ralph, Kate Stakelum, Ellen McGonagle, Rebecca Ní Shuirtáin and all team members are to be commended for what they contributed to this campaign. A great day ended with the county trophy being brought back to Gaelscoil Bhríde.